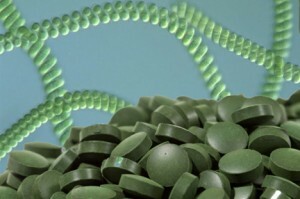 Spirulina super food of the future tablets, powders or use cosmetics with spirulina to make more beautiful and healthy. Spirulina is rich in amino acids and proteins that are beneficial to our health. It combines important nutrients such as iron, zinc, copper, manganese, selenium, beta-carotene, vitamin B 12, vitamin E and gamma-linolenic acid. Spirulina is the name of the algae that occurs in brackish alkaline water of the lakes. It received its name because of its spiral shape. Multiply naturally, but for many years cultivated in nurseries. The color is green and it is due to chlorophyll and blue protein phycocyanin. Experts say that it contains 65% protein. It is a cyanobacterium, which means a bacterium and plant simultaneously. Spirulina and its health benefits. The power of spirulina is confirmed by hundreds of studies. It contains all eight essential amino acids and ten more that are responsible for maintaining good health. People who consume notice that enhances their vitality and energy. Increases antioxidant defenses, fights free radicals and aging. More beautiful and healthy with spirulina. Spirulina is an immune system stimulant. According to experts taking spirulina increases production of antibodies that fight infection and diseases that attack the body. Due to their antimicrobial properties, it destroys harmful bacteria and viruses. 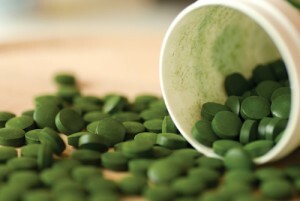 Consuming spirulina as a food supplement, we will have healthy bones, teeth and nails. Spirulina extract used as an ingredient in cosmetics because it improves metabolism, blood circulation and skin elasticity. Day Face Cream with spirulina increases the tone, makes skin firmer and younger regains its kind. Cosmetics with spirulina removes surface wrinkles and roughness, nourishes and shrinks pores. Study done by Simpor confirms that these algae are rich in copper, manganese, iron, protein, zinc, vitamin B1 and B2 and many other nutrients. Her rich and nutrient composition, as well as its abundance in Africa, leads the Simpor and his colleagues argue that Spirulina can solve the crisis with malnutrition on the continent. Spirulina is easily digested, it strengthens the immune system and lowers cholesterol. It is an important ally in maintaining our good health and beautiful skin healthy hair. Consumption of Spirulina helps us maintain a healthy and balanced diet. It is commercially available as a dietary supplement spirulina tablets, powder, capsules or flakes and cosmetics with spirulina.